Week 17 Challenge - Alter It! Can it really be Friday again? It must be as its a brand new Polkadoodle challenge! Did you see Nikky on telly last Friday with the very lovely and brand new cd All Around and Everywhere? Well, the DT have really fallen for the cd and I think this week we have all used something from the cd! 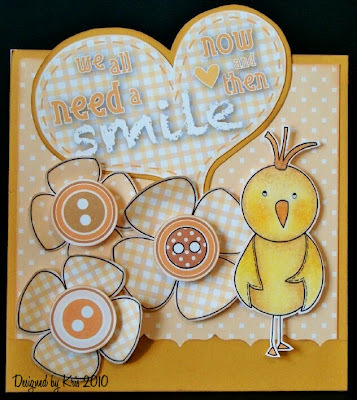 Before I forget, make sure you get your copy of Simply Cards and Papercrafts magazine which is the May issue (out this week sometime) as Nikky has designed the free paper collections and if you're an owl fan like all of us you'll love them! There is plenty of inspiration from the Design Team to help you on your way. And if you decide to join us, please link your creation using Mr Linky and your creation should not be entered into more than 10 challenges including Polkadoodles to be considered for a top 3 blinkie or the winners prize. Congratulations and please contact Nikky for more details! Ruth: I found an empty plastic jar last time I was at the Scrap Store and I knew I'd find a use for it one day! 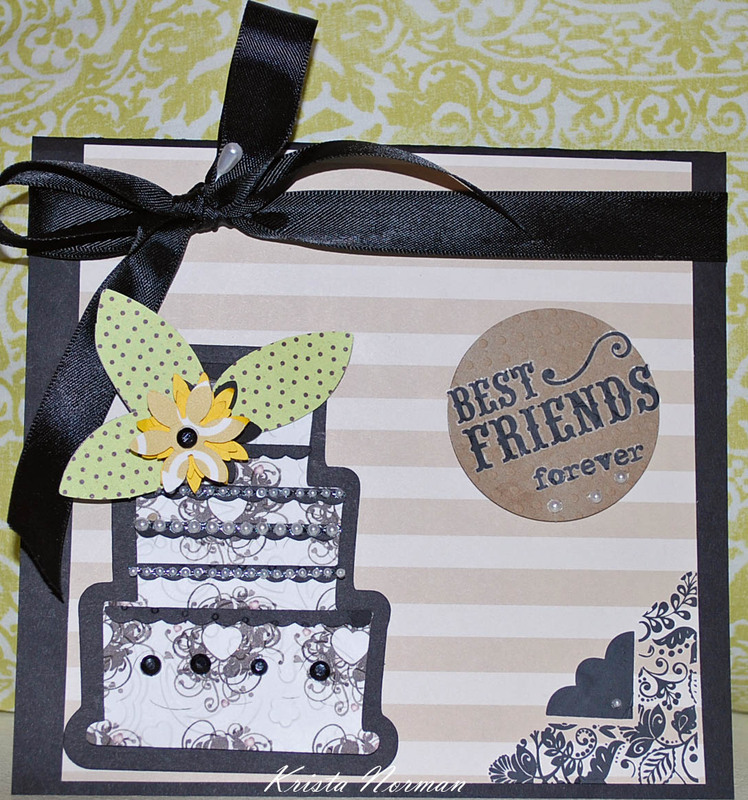 I've used papers from All Around and Everywhere including the topper which I've layered onto black card. All ribbons are from my stash. More views are on my blog! Brenda - How do you photograph a fold down zigzag card - with great difficulty ! I have again used elements from various sections of the new CD - All Around and Everywhere. 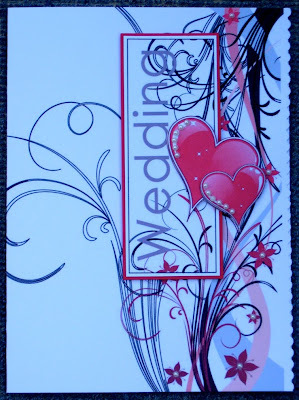 Each square has been cut from the back sheets of two used spiral notebooks and covered on both sides with a mixture of papers and bazzil, with flowers and heart all taken from the CD, then ribbons, brads and borders added to embellish. Kerry - Plan A went to pot, I was going to stamp the candle but I got more wax on my desk!! So Plan B came into force, decorate it. I used papers and flowers from All Around and Everywhere, a Polkadoodles stamp and string. Kate I needed somewhere to store my lovely fairy stamps, so I have made use of a laundry detergent tablet box. 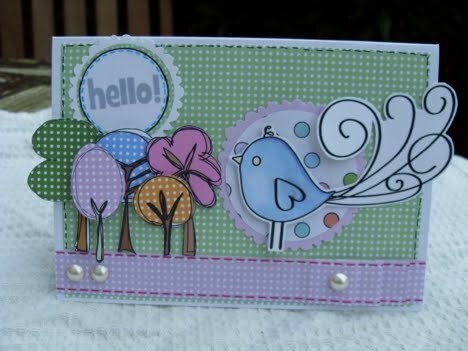 I have used papers from Sugar Birdies (I think this has to be my favourite) and petals from the new cd All Around and Everywhere and of course those gorgeous fairy flutterfly stamps. 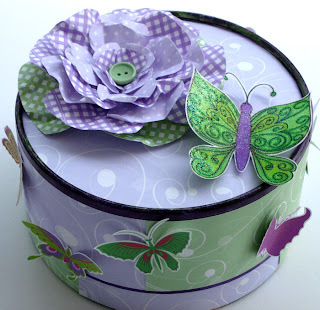 Fliss: I've altered a toiletries box which was lurking in my daughter's bin and turned it into a gift/trinket box. All the papers and elements I've used come from the new All Around and Everywhere CD and I used Nikky's fab scrunching technique to make the flower. 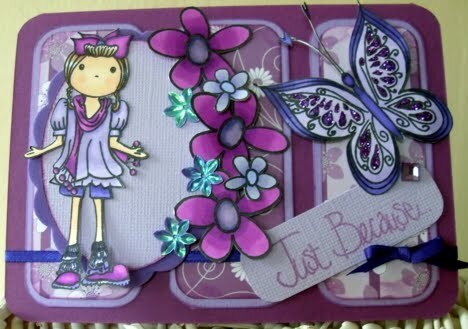 I used the non coloured butterfly stampie, coloured it with my Promarkers, sponged on embossing ink and embossed it with crystal powder for added sparkle. Nettie: This was a fun one to do. I decided to make a mini album of my nephew's 4th birthday. I have used four toilet roll shells for this one. I have seen these albums made out of toilet rolls and always wanted to have a go, so this is my version. I used my Bind it All machine to put the album together. 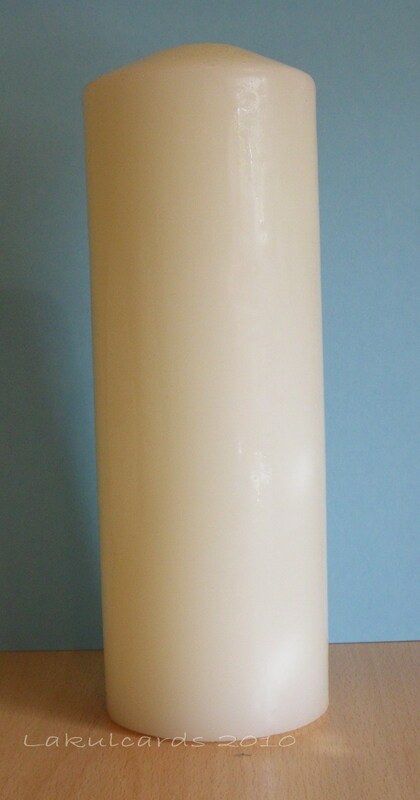 I have used the very new CD All Around and Everywhere. For more detail please visit my blog. Claire Everybody needs a bits box - for all those teeny weeny crafting things that would disappear up the hoover otherwise. Mine is no longer dull and dreary it's funky flutterby heaven - with those fab new stamps coloured with copics and some papers thanks to All Around and Everywhere. 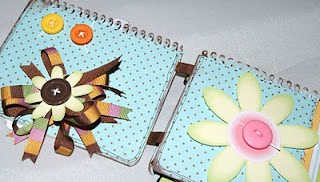 Dee: I've had a sad and empty list pad holder that I've been meaning to revamp for ages. I got a new pad for it some time ago but just haven't got round to it yet, so now was my chance. I used papers from the All Around and Everywhere cd, added a few silk flowers I had hanging around and some garden twine. And now I can slip another pad in when this one is finished, unlike the original that was stuck to the back piece. Stacey - Having completely smashed my first attempt this is my create your own cookie jar!!! 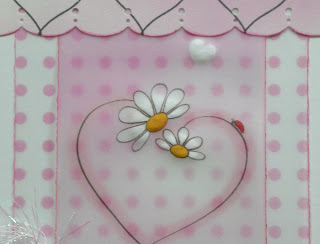 I have used the big polka dots papers from All Around and Everywhere and I have printed them in brown and pink. I made a little corset on the back to secure it to the jar so it can easily be removed and the jar can be reused. I added a cute pink sentiment to finish it off! 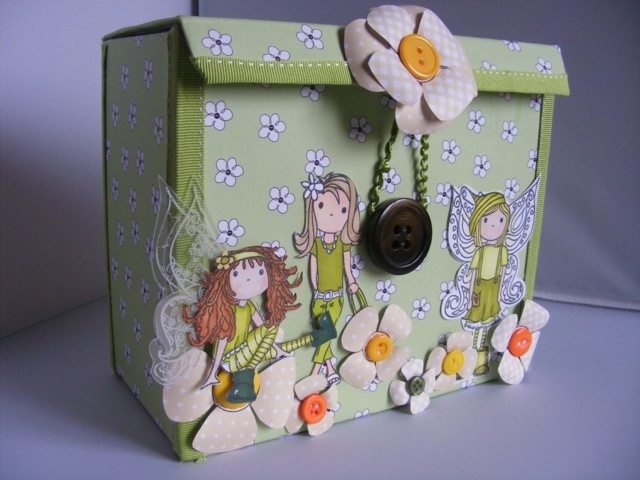 Lou: I wanted to safely store my new Fairy Flutterby stamps so Ruth's challenge couldn't of come at a better time ! ! I have used an old CD case and given it a real makeover! 1st photo is of the front cover showing all stamps etc and the 2nd photo is showing the inside. On one side I have made a pouch to store my stamped images / made toppers and the other side stores my stamps. Now have a few more of these to make so everythig matches . . . uuummmm, we have ooddles of old DVD cases . . . I wonder what I could do with those ! ! Even more photo's can be found on my blog. Please remember that the maximum number of challenges you can enter your Polkadoodle challenge creation in is 10 (including Polkadoodles) and that the closing date is 12noon on Sunday 9 May 2010. Good luck! Today sees the launch of a brand new Polkadoodle CD - All Around and Everywhere which is being showcased on Create and Craft at 10am this morning! And this week the Design Team have used (in abundance) papers and elements from the new cd! If you've not managed to catch the show you've missed a real treat as this is another stunning cd from Nikky! We could go on about it, but make your own mind up - just look at the DT samples for this weeks challenge! 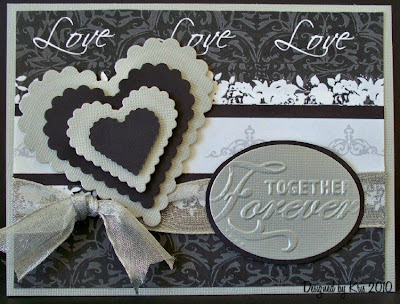 Before we show the samples for this weeks challenge, we need to announce the winners from week 14 which was the Wedding theme set by Kerry. Congratulations! Please contact Nikky for further details and your blinkies! We can't wait to see what you come up with for this week's challenge. It's Nettie here and it's my turn again to set the theme for the week. I have chosen Monochromatic (I know a bit of a mouth full). 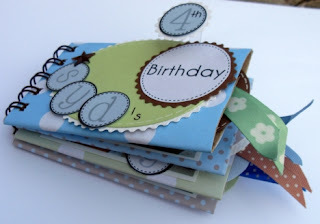 So I would like to see cards or projects in one colour but I remember you can use as many shades of this colour as you like. The DT have been working really hard and have produced some gorgeous cards and also given you a sneeky peek of the new CD!! 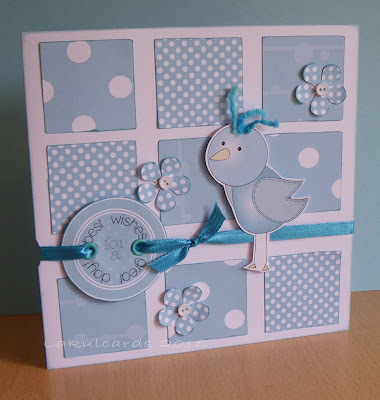 Brenda - I have used the brand new Polkadoodle CD All Around and Everywhere which Nikky is launching on Create and Craft today. 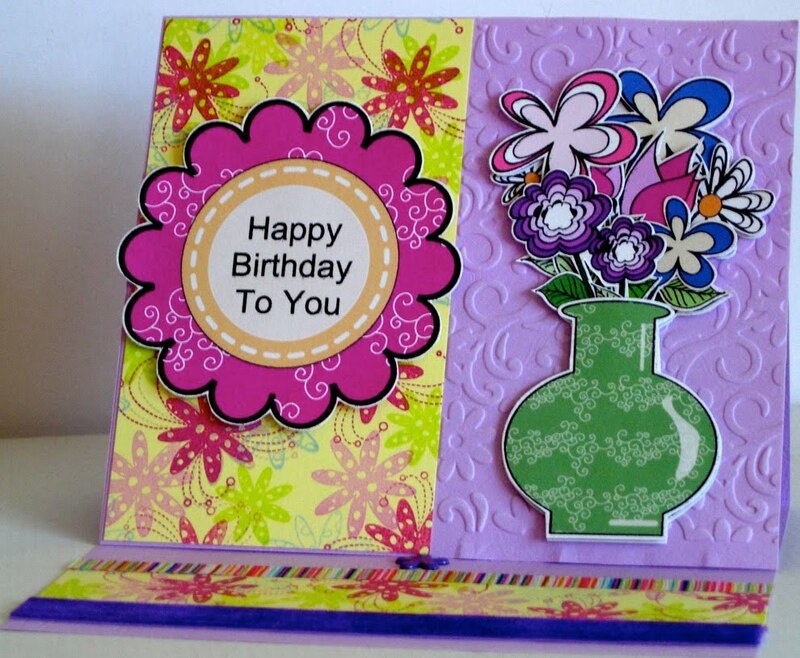 It was a really quick and simple card to make yet the beautiful flowers and colours allow you to really make a statement. The side border has been created with a Martha Stewart punch and the butterflies are stamped from the Meechell set of the new Fairy Flutterfly stamps and the sentiment from the Gracie set. Enfys - Well I suppose if you are a purist mine isn't totally monochromatic, but to echo the black heart on the birdhouse, I couldn't resist a bit of black doodling. The papers and birds are from the new CD, the branch was cut with my Cricut. Kris: I love the spring/summer colors in Nikky's brand-new-today new CD and for our challenge this week I chose the yellow/orange color. It paired perfectly with some card stock I had. I used a spotty backing paper along with one of the heart-shaped sentiment toppers, stacking flowers with button centers, and a cute little bird stampie that I tried to get close to the color of everything else. Kate: I have used "Gracie" one of the gorgeous new fairy stamps for my card and gone for a colour which I wouldn't normally go for - Orange, the little flower stamps in the set matched so well with papers from the sugar birdies cd, I just had to use them together .The wings which are as a separate butterfly are stamped on acetate and coloured and glittered from behind . Kerry - I've used papers from the new CD too - All Around & Everywhere. There are loads of fab papers, toppers, flowers, buttons and more..... Love the colour, a turquoise blue and just added a bit of ribbon (from the inside of a t-shirt), a few buttons and some wool for his hair. Ruth: Ok, so its a riot of colour in a monochromatic style! Each windmill is monochromatic, just there are a few of them in different colours.....! I printed doublesided with papers from the new cd All Around and Everywhere, used a windmill template and then added some large brads for the centres all on the trusty kebab sticks! For more views have a look at my blog! 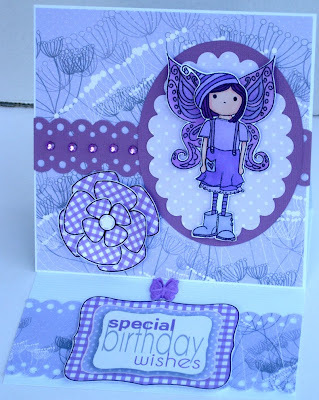 Nettie: For my card I have used one of my favourite colours Purple. 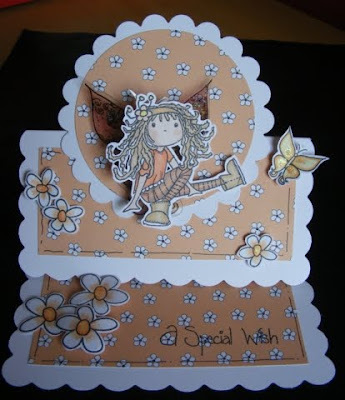 I have used the Babsie Fairy Flutterfly set for my card and coloured her in using my Promarkers. I also added a tiny bit of bling. Fliss: I've used purple as well as it's one of my favourite colours and there are just gorgeous mix and match papers on the new CD so I've used one of those with some of the lovely gingham flowers. The lovely fairy is Bevvieboo, one of the totally awesome new Polka Doodles clear stamp sets. I fi nished off with one of the sentiment labels and some gems. Dee: Another Fairy Flutterby stamp from me too, this is Maggie and I just love the toadstools on this set. 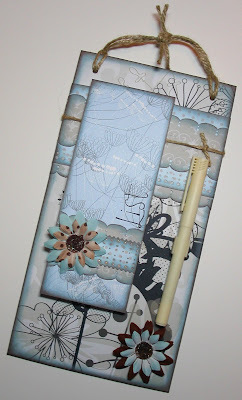 I masked and stamped onto light blue watercolour paper with the Denim Adirondack ink pad. I then pulled the colour from the image with a water brush, tore the edges and stamped flowers round the edge to form a frame. The polkadot paper is from All Around and Everywhere and the random dot paper which I overstamped with th e flower is from Paper Boutique. I finished it off with stickles, blue ribbon and a dragonfly brad. Stacey - Well I am just loving the new CD and like the others I have opted to use it for this weeks challenge!!! I have gone green!!! 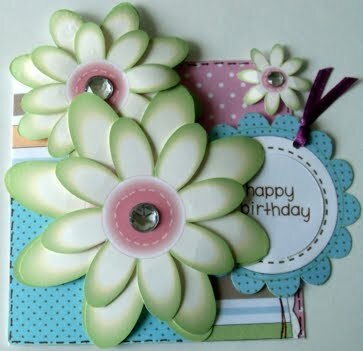 I have used papers, flowers and sentiments and they are all found on the new CD and the shaped card is just a big scallop folded in half!!! For added embellishment I have mounted a tiny flower onto some acetate and they used a big spotty brad and some eyelets!!! Remember you have until Sunday 2 May at 12noon GMT to enter the challenge. Please leave a direct link with Mr Linky to your creation. Good luck! 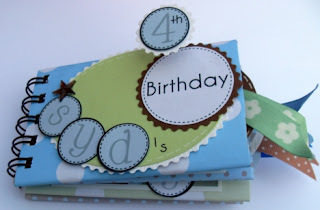 Ruth: I've used the monkey from Paper Boutique and also the backing paper from the same set. he has been printed at A5 size and decoupaged almost as per instructions! And yes my card is slightly wonky! I blame the banana! Kris: I've also used the Funky Monkey from the Paper Boutique CD. I chose a "viney" backing paper from an earlier CD (can't remember which so I'll leave it at that-LOL!). 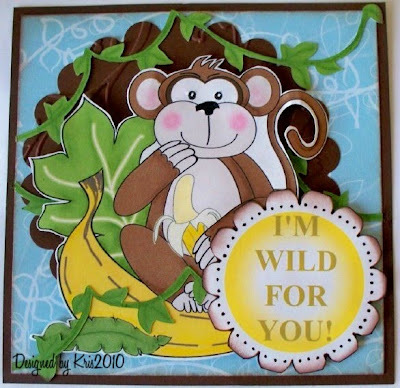 I also did one of the fill-in toppers with my "wild" sentiment and couldn't resist adding some die-cut vines. Brenda - At the risk of scaring away all the wild bunnies living out in the paddocks with a giant pink one, I decided to use this lovely fellow from the Paper Boutique CD for a fun get well card for my DD who spent Easter in hospital after a riding accident. I decoupaging him using one of the matching papers. The Martha Stewart bunny border matches perfectly and I made a flower from the same papers and spritzed with Glimmer Mist pearl. Claire I have settled on that fantastic piggy from Back to Nature CD - Get into shape section. 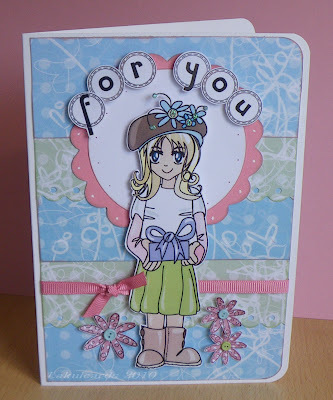 With an additional wire and button necklace and a few flowers (some lovely stamped doodle flowers from the new Polkadoodles stamps)...she's just looking so cute! 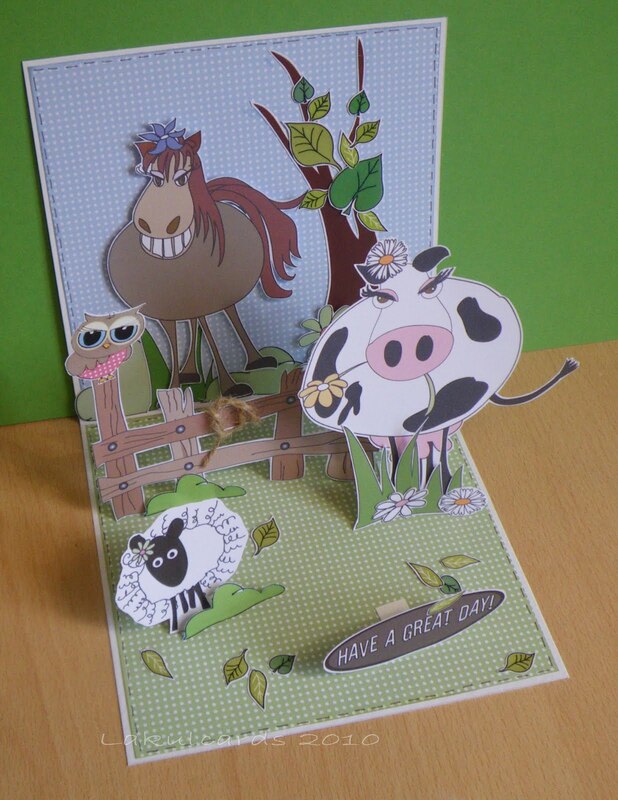 Kerry - I had great fun making this, my farmyard scene. All the papers and animals (plus 1 bird) come from my favourite CD Back to Nature. I took the scene from a couple of angles so you can see the details. Nettie: I have mixed and matched with my card this week. The bird is from the Love and Cherish CD and the rest of the card was made using my favourite Back to Nature CD. I have coloured the cute birdie in with my Promarkers. Kate I have used BTN to make this enormous card for my boss for her birthday from all of us at work - i printed it at A4 size and then stuck it all to an A4 card blank . 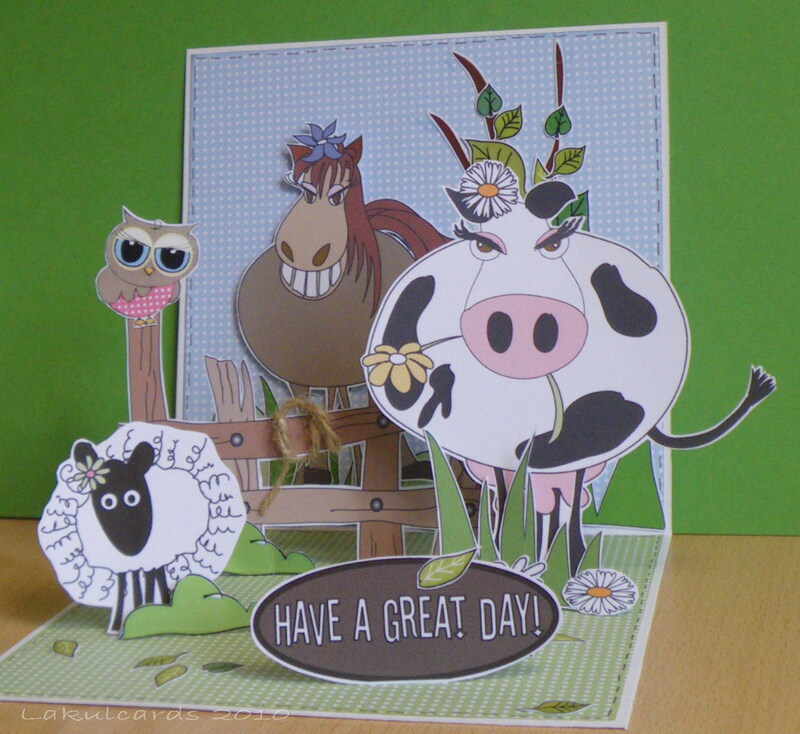 i made the rosette using Nesties and papers from BTN .I added the little person which i had made to look just like her , and Priscilla the horse looks just like her horse -"Willie "
Fliss: I've gone very girly this week with the lovely kitty cat from the Back to Nature CD and I've combined her with some papers I made myself using some of the clever Crown and Chandelier elements from the Love and Cherish CD. 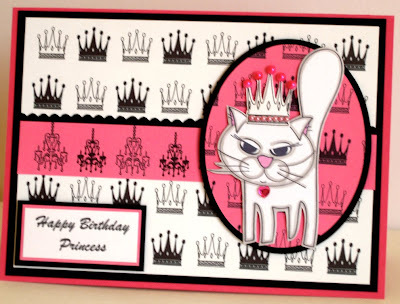 I did a little colouring with Promarkers on the kitty stampie, cut her out and made her a crown decorated with pearls. Check out my blog to see how I made the papers as they're easier than you might think. Stacey - I have been inspired by nature this week! I live in a rural village in Wales and there are little lambs popping up everywhere so I have headed straight to the Back to Nature CD for the super cute sheep images! The backgrounds are just fab so I haven't done too much just a bit of glitter and some decoupage and finished off with some cool googly eyes!!! Lou - I have made a relatively unfussy card for me (!) and stuck to the cute dog images from the Back to Nature CD. I have cut them in squares, loads of chalking and then lots of layering. Card has been finished off with paper squares from the same CD. The sentiment reads "W oof-tas-tic !!! ". Quick, simple and effective card . . I hope! Don't forget you can enter your creation in up to 10 challenges including Polkadoodles and the closing is Sunday 25 April at 12noon GMT. Kerry here, setting this weeks challenge. I haven't had a wedding for years and now I have three in one year. My niece who was just a few weeks old at our wedding is getting married today (9th) and my friend tomorrow (10th) and my hubbys 2nd cousin in July. Good excuse for some new outfits. Before we see all the lovely designs from our team, well done to our lucky top 3 who have won Challenge 12 - Nettie's sketch and colour theme. Well done you you all, please contact Nikky for further details and to collect your blinkies. So, I thinks it's obvious what challenge I'm going to set, yes it's a wedding card or project. The closing date is noon GMT on Sunday 18th April. Don't forget that you can only combine my challenge with 9 other challenges. Stacey- I love this CD so much that I have pinched the title for my sentiment! more pics on my blog. This card will be for my next door neighbour who is getting married next month. The subtle grey and silver papers are just so elegant. 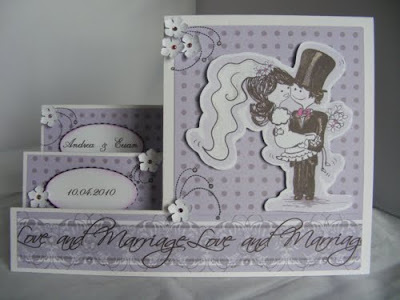 Kris - I was so excited when Kerry took this week's challenge and called for a wedding card. Like her, we have a niece getting married (only on the 17th of this month) and this gave me a great opportunity to get her card done. 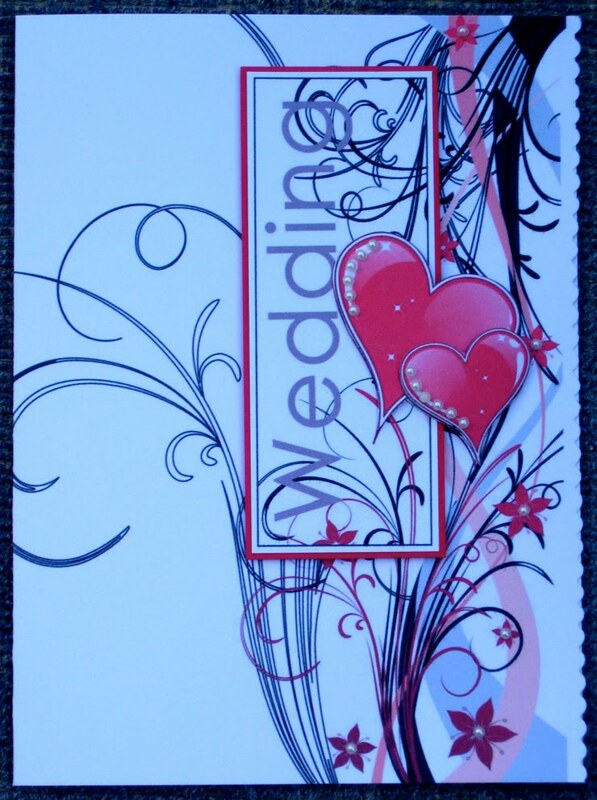 All of the backing papers are from Love & Cherish - Moonlight Collection. I think the black/white/silver looks so elegant. I added some die-cut hearts and an embossed sentiment. Brenda - An easel card using papers and topper from Love and Romance CD - think must still be my favourite judging by how often I use it. 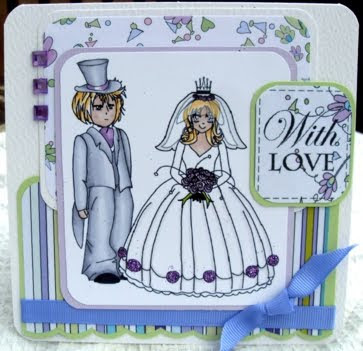 The wedding cake topper is coloured with Promarkers and the borders Martha Stewart embossed heart. 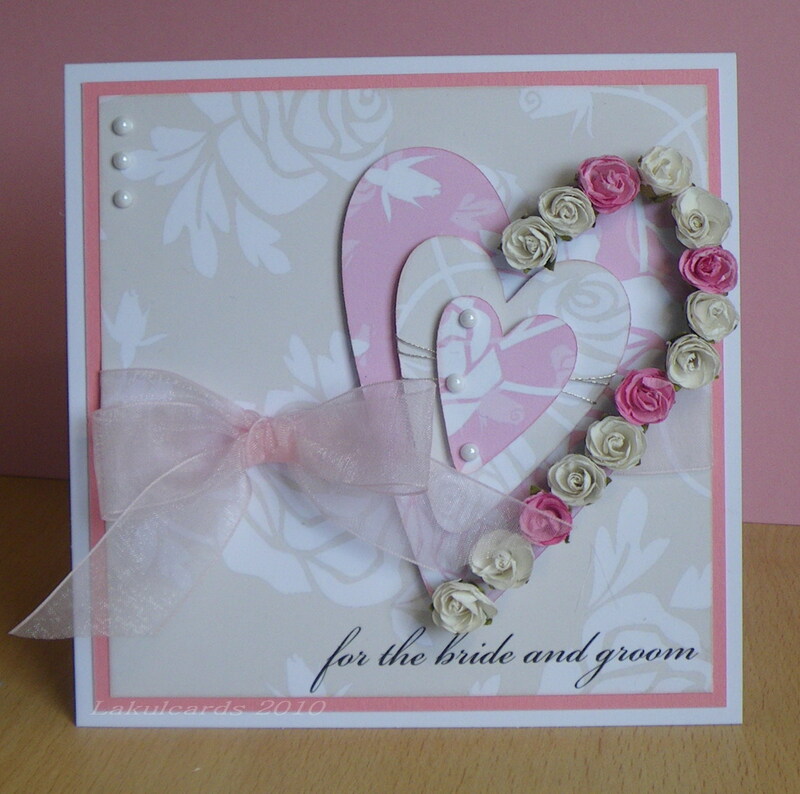 Kerry - Here’s my card and it’s a little bit different for me, lots of little rose buds around the heart. The rose papers from the Love and Cherish CD were perfect for this card and printed out beautifully. I used my Cricut to cut out the layered hearts. Nettie: I have used this cute couple from the Love and Cherish CD and coloured them in using my ProMarkers. I have used Lilac as my main colour for this one and gone for my favourite square shaped card. Kate : I have used one of the toppers on the Love and Cherish cd for mine, the spotty backing paper was on the Back to Nature cd but it is usually beige. My printer is still printing in a wide range of colours other than what I want and it came out purple it matched perfectly with the shade of purple it printed the other embellishments! I think it would have looked just as nice in the beige tones I intended. Claire - I have used one of the same Wedding cakes as Brenda - from Love & Cherish with papers from Paper Boutique, a little doodling with Sakura and some distressing with bronze inking to edges. Dee - A simple card from me this week. I've used papers from the Love and Cherish CD. The top piece is printed onto iridescent white sparkle inkjet paper, and the polka dots and main image are printed onto vellum for a nice soft feel. 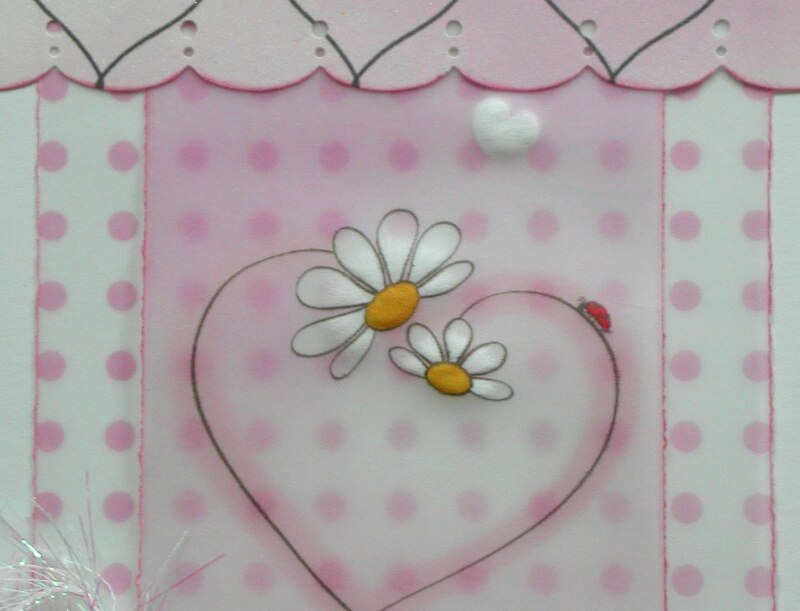 I have highlighted the daisies and the little heart on the main image by embossing the back with a medium sized ball tool. 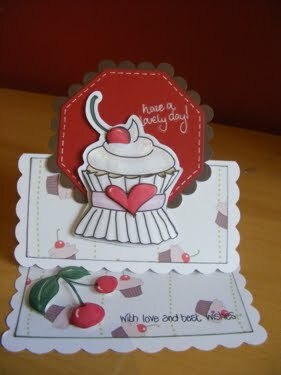 Fliss: My card this week is also quite a simple one using the Love & Cherish red heart and flourish papers and toppers. 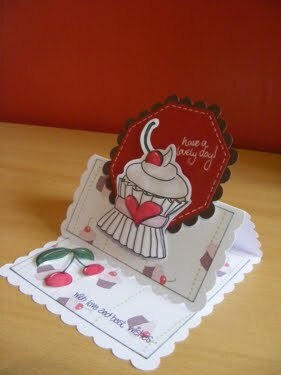 I just printed out a sheet to fold in half and create my card, then added a topper on a red paper mat and some more decoupaged hearts for dimension. I finished off with some pearls. 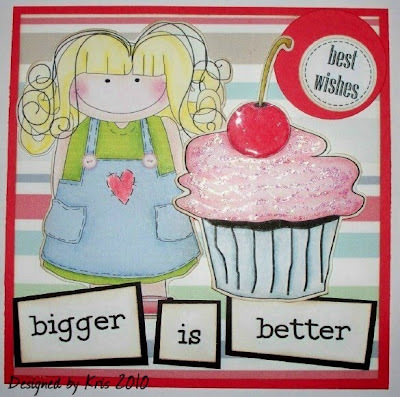 Ruth: I used the new Paper Boutique cd and printed the card base and tiny decoupage image onto 240gsm linen effect white card, layered up the image (although I cut off most of the really fiddly bits!) 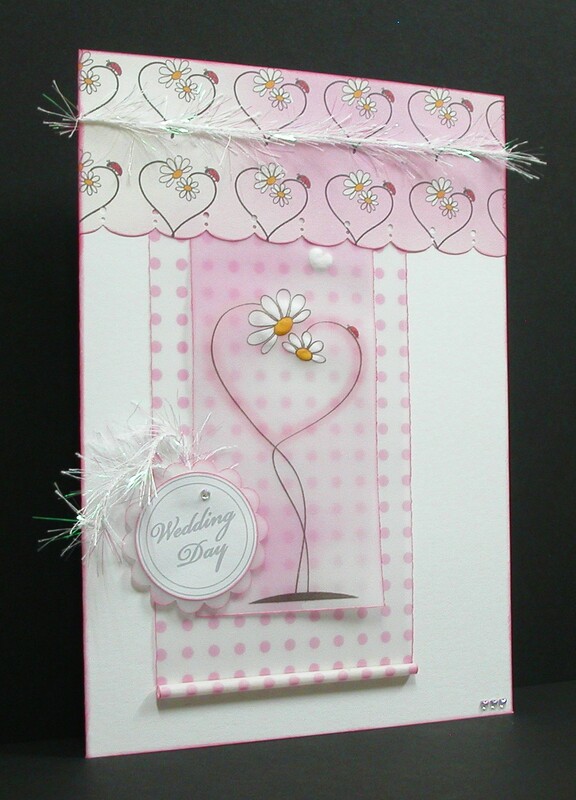 The shape of the card is based on I think a Robo template which I drew round, punched holes out and threaded organza ribbon through. And added a silver heart! Krista- Using the Love and Cherish cd is always one of my favs...Thinking of my husband I always think of marriage as a union of love and the best of friends. This card was simple and sweet. 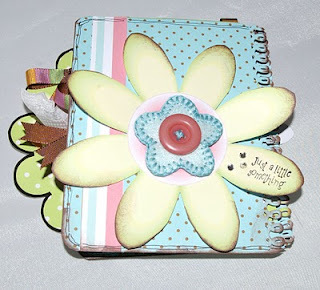 The cake, background and flowers all used gorgeous papers from this cd. Good luck and the deadline is Sunday 18th April at 12noon GMT! Week 13 Challenge - Birthday! 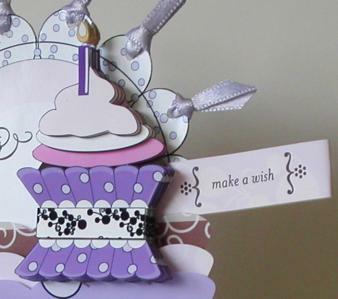 You can make a Birthday card for anyone you wish, just as long as it is a Birthday theme. We only have a few rules - for the theme to be followed and your card to be entered into no more than 10 challenges including Polkadoodles. If you accept the challenge, please enter the direct link back to your blog post on Mr Linky below. And good luck! You have until 12noon GMT on Sunday 11 April to enter. Well done! Please contact Nikky for more details and for your blinkies! Kris - I thought I wasn't going to make the celebration! I'm again using up some of my older scraps and I thought Polly with a great big old cupcake would be just perfect for this. I added a bunch of glitter glue and glossy accents on the cherry. Happy Birthday Ruth! Ruth: I've used the front elements of the Sparkle Cake from Paper Boutique, layered them all up and added the necessary glitter to the icing layers! I've printed directly onto the card blank - and used the backing paper from the same collection along with the sentiment backer too. More details are on my blog! Brenda - Background paper from Back to Nature CD as is the peacock which I printed off five times onto cardstock and cut with nesties to create a pyramage effect. Flowers on the centre band and greeting from the stamp set which matches the BTN CD. Kerry - Happy Birthday Ruth and here is my gift to you. 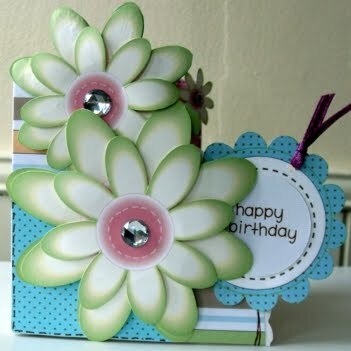 All papers are from Back to Nature and I've used the Polkadoodles stamps for the flowers. I added some Stickles on her hat. Have a great Birthday. Nettie: Happy, Happy Birthday Ruth!! Here is my card for you. It's a dinky one this week and I have kept it simple but very girly. 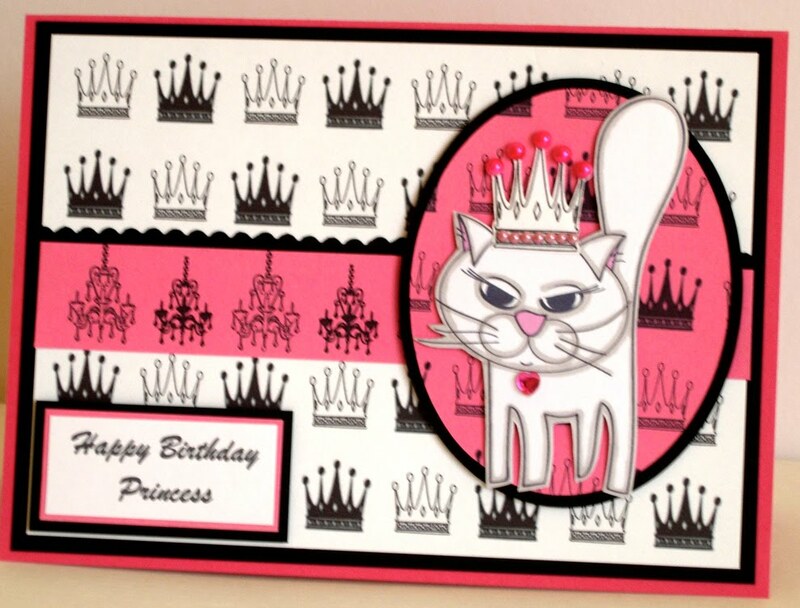 I have used the Paper Boutique papers and images for this one and added a little bling. Dee. 2 cakes in one here for you Ruth so you may need to ration yourself, or just ignore the calories. 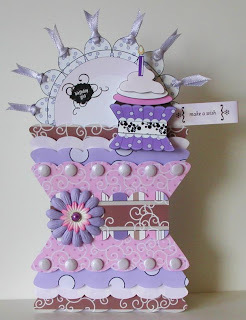 I used the A5 template, decoupage, toppers and backing papers from the Cupcake Treat section on the Paper Boutique Vol 1 CD. I added some card candy, ribbon, flowers, fancy brad and a couple of rub-ons to complete the look. 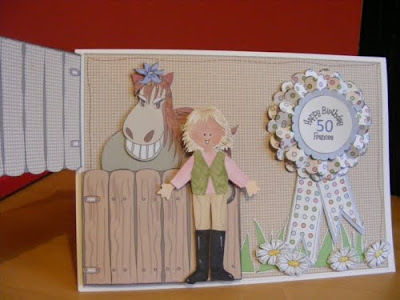 Claire - Happy Birthday Ruth - I decided to give the wonderful Secret Garden template a go for my birthday card. With some added interest in the form of crackled glass effect with UTEE. Please note I know you are younger than me....so this is more a comment on my complexion! 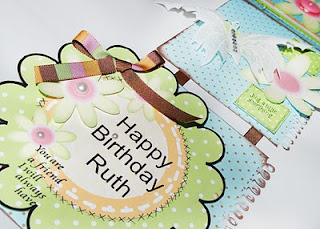 Fliss: Happy Birthday Ruth! 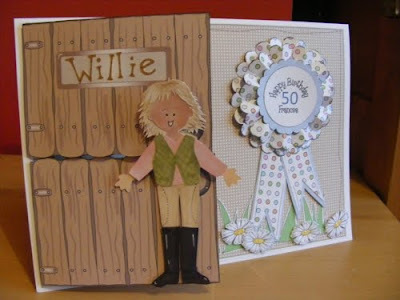 I decided to make a wildly floral card in the hope Spring will turn up and stay. 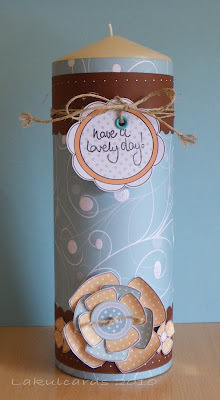 I made the background paper with the Daisy Doodles stamps (instructions on my blog) and made a small vase of flowers from the Floral Bouquet Collection on the Paper Boutique CD. I made a large easel style card and embossed one side then added all the pieces with a sentiment printed on the same collection editable decorations. Good luck if you decide to enter our challenge and you have until 12noon GMT on Sunday 11 April to enter!